Good things do come in large packages – Extra large dog breeds packages. There is a whole lot of joy packed into those 100 – 200 pound bodies. These gentle giants usually have a mild, often comical temperament. Many are great family dogs. Be prepared to adjust your budget to their often large appetites. They need high quality foods, low in carbohydrates and supplements to keep them healthy. Life expectancy can range from 8 – 14 years. High quality dog food and nutritional dog supplements can help extend and add quality to the extra large dog breeds life. An extra large dog breed will require equipment tailored to their size; large dog feeding bowls, large dog beds and large dog toys. Prepare for some work in the grooming of these giant dog breeds. Your home bath tub can prove a bit small when attempting to wash these dogs. Consider professional dog grooming or rent a tub at a self serve dog wash. Many of these are popping up across the country for those with neither the space or inclination to use their home tub.. Extra large breed dogs can be prone to some health problems less common in the small dog breeds and medium size dog breeds. For instance, hip dysplasia is common in the large dog breeds. Be sure to check the genetic problems common to the dog breed you choose. If you buy from a breeder, insist on history and references. Better yet, adopt from a local dog shelter or breed specific dog rescue group. True, some of these dogs come with their own set of problems but they are already here and need a home. I think they tend to make the best pets and hey, we all have baggage. 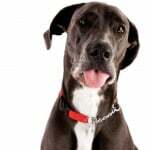 Great Dane – One of the tallest dogs. Friendly, known as “the gentle giant”. Short hair. Saint Bernard – Extremely gentle. Long hair. Rottweiler – Reliable and loving with their family, very protective. Short hair. Mastiff – Gentle with family, excellent with children. Shorter hair. 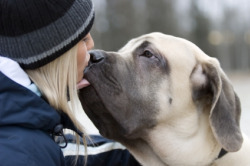 Bull Mastiff – Good natured, docile and affectionate. Shorter hair. Newfoundland – Calm and gentle. Long hair. Irish Wolfhound – Gentle, also one of the tallest dogs. Shorter hair. Akita – Docile, affectionate, courageous. May be dog selective. American Bulldog – Loves children, loyal, not hostile. Short hair. Greater Swiss Mountain Dog – Not aggressive, loves to please, excellent with children. Long hair. Black Russian Terrier – Protective, loves children, needs to be close to owner. Longer hair. Bloodhound – Mild-mannered, lovable, very gentle. Short hair. Many of the extra large dog breeds do quite well in apartments and smaller spaces as long as they are provided with regular exercise in the form of walks and trips to dog parks. These big dog breeds can also be great with kids and love to play and romp with them, often seeing themselves as one of the kids. Care must be taken when selecting a giant dog breed if you have very small children. Often these larger breeds do not realize their size and can be quite clumsy, knocking over smaller kids. An extra large dog breed will require equipment tailored to their size; large dog feeding bowls, large dog beds and large dog toys. A good quality food for large breed dogs is a necessity, one with premium ingredients. 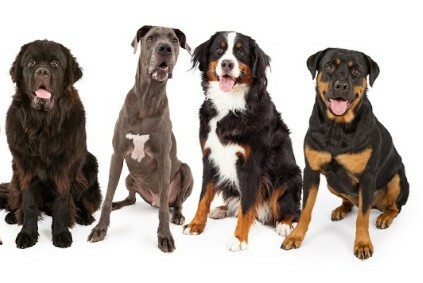 Quality supplements added to the large dog breed diet will help to keep him active and healthy. When considering dog adoptions and deciding which of the extra large dog breeds to add to your family, check out some of the dog rescue organizations specific to the breeds you are interested in. They will help you to decide which are good dog breeds for children, which are best dog breeds for your lifestyle and answer any questions you may have. 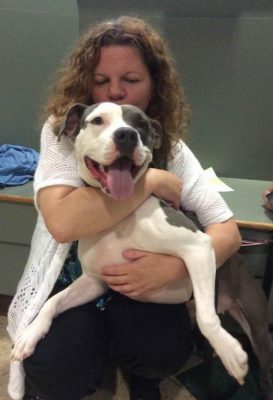 These dog rescue shelters are there for the benefit of the dog and they want to make sure the match-up between the dog and it’s new guardian is a successful one for all involved. You can find the dog rescue groups through your local yellow pages, through local Vets and on-line by searching under the breed name and adding your state and the words “rescue groups”.